On the furthest side of the coast, from Rost then north to Vannøya in North Troms, cod fishing is well underway. Not only are there a lot of cod, it is also of exceptionally good quality. The can be partly explained by how cod is following herring on their spawning migration south along the coast. Then there are also large amounts of capelin that come to the coast to spawn. Normally, this westward capelin spawning migration does not happen every year. According to marine research institute, capelin tend to spawn outside of Finnmark – and so it contributes to the traditional spring cod fishing primarily because young cod are already coming in to shore to feed on capelin. But for cod, this capelin western spawning poses no disadvantage since they can hold its own in the spawning ground when up against the capelin. The cod in the picture was taken at Malang in mid-March. It weighed 15 kg and had 2-3 kilos of capelin in the stomach as well as large eggs. No wonder it’s fat! Cod fishing is best early in the day when they indulge on capelin – before they have eaten their fill and are hard to get on the hook. When the cod feeds on capelin, it can be hard to find because it chases after capelin and are always on the move. Although one can spot cod with sonar and catch fish on the first cast, it is not certain that it is in the same place when you go up again to run over the same area. A tip is to make sure to have one line out all the time – and the cod will follow! The fisherman who gave me this tip had gone fishing continuously for two hours while the boat drifted with the wind and current. One important point with cod is that it must be gutted shortly after capture, otherwise the quality eventually worsens. It is recommended that cod fish should be gutted within 4 hours after capture. When should we start fishing for cod? 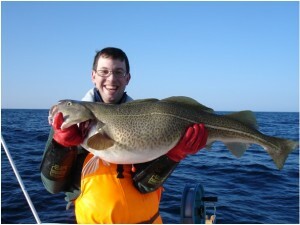 The first catches of cod are reported usually right before Christmas. Then, the season for cod fishing continues right up until the end of April. This is the time when cod heads north to the Barents Sea. Although cod arrives in the outer coastal regions in early winter, it is not necessary to head out when the cold winds are raging. Cod fishing is done after all on the outer coast instead of the open sea. Even though professional fishermen begin early in the year it is probably the latter half of March and especially April, that is best suited for fishing when the weather is usually better. It is often milder and less windy. In addition, the days are much longer, which is important since you have to head far out to the fishing grounds. I personally use at least 1.5 hours going at speeds of 20 knots from the harbour in Tromsø out to Malangsgrunnen where large schools of cod lay waiting. Head out in good weather! Before venturing out to the big banks, you may want to check the wind and wave conditions carefully. I have a 24 ft speedboat, but despite how it is a wide and stable boat, it’s easy to get caught up in strong winds. Attempting to fish when the boat rolls is not much fun so before I leave I check out wind speed recordings at YR.NO and in addition, readings from Seawatch: http://seawatch.mg.uoa.gr/. Light south-easterly winds that last for a few days is best. By this time, any major currents from other directions had calmed down and coastal waves are not so big. To avoid too much leeway, I use the sea anchor to keep the boat in position and helps to alleviate the impact of the waves. What to do with all the cod? Generally, cod is usually large, with many fish weighing in at both 15 and 20 kilograms. It’s exciting to get that big cod fishing rod, but it quickly becomes tiring in arms when big cod have to be reeled in from 80-100 meters. Instead you may want to have a jigging reel. If the weather is good and the fish is biting, your catch can fast becoming significant. After “molja” is eaten, “boknafisk” is hung up to dry, freezer filled and the fish salted, one can also sell cod in one of the many fish farms along the coast. As recreational fishermen, all Norwegians this year (2013) are allowed to sell 1333 kg gutted and beheaded cod, which with a conversion factor of 1.5 amounts to 2000 kg of live weight. The lowest price for cod between 2.5 and 6 kg (gutted and headed) is currently 10.50 – U.S. $ / kg, which means that recreational fishers can sell cod at around 13 000kr. Happy fishing!